I am so excited to be sharing a new Riley Blake Design Team tutorial with you today!!! When I first saw the Modern Scouting Fabric line I just knew I had to create with it. My oldest is currently working on his Eagle Scout project and I just knew this would be perfect for him. And luckily, Riley Blake made an awesome Quilt Panel and Banner Panel that made creating with it so easy and so fun!!! So here it is, the Modern Scout Duo!!! And of course, I had to make up the pennant banner to go along with the quilt, or it wouldn't be a duo ;) The tutorial also walks you through the basics of how to put these easy to use banner panels together. Seriously, this is one of those instant gratification projects, so fast, and so fun!!!! So let's get to it!!!! If you are using a 10" stacker, cut 12 Dark pieces into (4) 5" x 5" squares each for a total of (48) Dark 5" x 5" squares and cut 12 Light pieces into (4) 5" x 5" squares each for a total of (48) Light 5" x 5" squares. If you are using 5" stackers, the cutting is already done. Simply choose (48) Light 5" x 5" squares and (48) Dark 5" x 5" squares. From your Binding Fabric cut (7) 2 1/2" x Width of Fabric Strips. Trim the Center Quilt Panel to measure exactly 34 1/2" x 42 1/2". There won't be much to trim from the top and bottom, and pay close attention to the trimming on the sides as there is not a lot of extra left over from the sides of the panel. And just like that, the cutting is done and you are ready to start piecing. We will start piecing by making the Half Square Triangles. Take your two piles of 5" squares, one light and one dark. Draw a diagonal line on the wrong side of all 48 Dark 5" squares. Place a marked Dark square and a Light square with right sides together. Pin if you like. Sew a 1/4" seam on either side of the drawn line. The easiest way to do this is to chain stitch all 48 sets. So start by sewing a 1/4" seam along the right hand side of the drawn line. When you reach the end of one square set, don't clip your threads, simply feed the next set of squares through your machine. Continue in this way until you have sewn a 1/4" seam along the right hand side of the drawn line on all 48 sets. Then simply clip the threads between the 48 sets sets. And you are ready to do it all over again. Now, simply feed all 48 sets through your machine again, this time sewing a 1/4" seam along the left hand side of the drawn line. Clip the threads between the sets when you are done sewing. Align your ruler along the drawn line and cut directly on the drawn line to create 2 triangles. Cut all 48 sets along the drawn line. Press your seam allowances towards the Dark fabric. I like to press from the front of my fabrics when I press HST's. Press all 96 Half Square Triangles. And now with your HST's all sewn and trimmed, you are ready to start making rows from them. Layout 44 Half Square Triangles into 4 rows of 11 HST's as shown below. 2 Rows with the Dark on the top left, and 2 Rows with the Dark on the top Right. Using a 1/4" seam, sew the 11 HST's together into 4 rows. Once again, chain stitching here will save you a whole lot of time. You can simply add one square at a time from each row, stitching all 4 rows at the same time. Then simply clip your threads and add another square. Continue in this fashion until you have sewn all 11 HST's in each of the 4 rows together. Now with your remaining Half Square Triangles, repeat the same process, only this time, there are 13 Half Square Triangles in each of your 4 rows. Press all 8 of your Half Square Triangle rows to one side or open, whichever you prefer. And finally, take your (7) 2 1/2" X Width of Fabric outer border strips. Trim the selvage and then using a 1/4" seam, sew the strips together end to end to make one long outer border strip. Press the seam allowance to one side. And now, you are ready to start adding all of your sewn borders or rows to your center quilt panel. We will start with the Inner Border. Layout the (4) 1 1/2" x WOF Inner Border strips along the edges of the center quilt panel as shown below. Place the 2 Side borders onto the center quilt panel with right sides together. I like to put a pin along the edges and the center to avoid stretching the panel. Sew a 21/4" seam along the pinned edge. Press the seam allowance outwards towards the inner border and trim any excess fabric from the edges. Now, place the top and bottom Inner Borders onto the center quilt panel with right sides together. Once again, I like to place a pin in the center and edges to avoid stretching. Stitch a 1/4" seam along the pinned edge. Press the seam allowance outwards towards the inner border and trim away the excess fabric from the edges. And just like that, the first border is added. Now we are just going to repeat that process with an additional 3 borders. Well start with the (4) 11 Half Square Triangle Rows. Layout the 4 Rows as shown below taking note of the light and dark placement. Repeat the same process as adding the Inner Border, pinning and sewing the sides first, but press inwards towards the Inner Border. Then pin and sew the top and bottom second and once again, press the seam allowance inwards toward the Inner Border. And then, you are ready to add the next (4) 13 Half Square Triangle Rows. Layout the 4 Rows as shown below, again taking note of the light and dark placement. Repeat the same process as adding the Inner Border again, pinning and sewing the sides first, but pressing the seam open. Then pin and sew the top and bottom second and once again, press the seam allowance open. And finally, the last border. Take your Long Outer Border and cut it into (4) 2 1/2" x 70" strips. And now it is just like adding the Inner Border all over again. Pin and sew the sides first, and pressi outwards towards the Outer Border. Then pin and sew the top and bottom second and once again, press the seam allowance outwards toward the Outer Border. And now your quilt top is done and all that is left is to Baste It, Quilt It, and Bind It!!! Which is a whole lot in one little sentence. If you are new to quilting, you can see my Finishing Your Quilt Series of Video Tutorials that will walk you through Basting, Quilting and Binding step by step. And now, you can step back and enjoy your awesome Modern Scout Quilt. 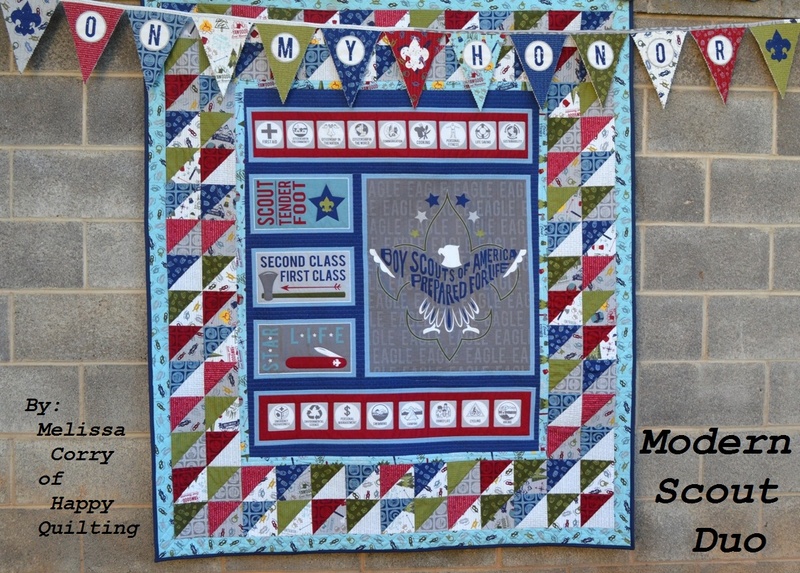 It finishes at 56" x 64" so it is just the perfect lap size quilt for your special scout!!! 4 1/2 Yards of a Hanging Element ie Double Folded Bias Tape, or Ric Rac, ect. And with your banner panel all quilted, you are ready to cut it apart. I like to use a Crinkle or Pinking Blade in my Rotary Cutter for this step, but if you don't have one, your straight blade will do just fine. Align your ruler along the edge of each pennant flat. Cut along the edge of your ruler. I found it easiest to cut the panel in half first, then cut out each individual pennant. Continue cutting until you have cut out all of the flags. Aren't they so cute!!! Starting at the Center of your Pennant flags and the Center of you hanging element, place the hanging element on top or around (depending on what you are using) the top of the first pennant flat. Stitch along the top of the flag, securing the hanging element to your pennant flag. 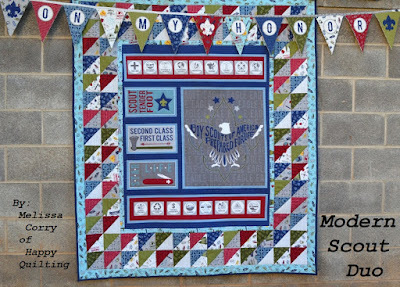 Continue stitching and adding pennants as you move outwards towards the end of your banner. When you reach the end of the flags, go ahead and finish the rest of your hanging element. If it is ric-rac you can simply backstitch and clip your threads. If it is Binding Tape you will want to continue stitching along the edge to close it up. Then, go back to the center of your banner and repeat the same process stitching outwards in the opposite direction until all of your flags have been added. Now simply sit back and enjoy how fantastic your Pennant Banner looks and how simple it was to put together. The banner will measure about 140" across and then you will have some leftover for hanging. Just perfect for decorating your next scout awards ceremony or party with!!! And that is the Modern Scout Duo Tutorial!!! I hope you have enjoyed these tutorials and will make up your own Modern Scout Duo ;) If you do, I would love to see them. You can email me a picture at happyquiltingmelissa@gmail.com or add it to my flickr group here or post it to social media with #happyquiltingwithmc. I can't wait to see your Quilts and Banners!!! Where can I purchase fabric to make a quilt and banner? I only saw fabric in large lots (or bolts). Congratulations to your son on his Eagle project! I have two nephews that are Eagle Scouts, as are my brother and step-brother. And my step brother is a scout executive with the Boy Scouts. I have got to find this fabric!! Thanks for the fun tutorial, too! Congrats to your son on soon becoming an Eagle Scout! The quilt is beautiful and he will have it forever! What a wonderful quilt project. So proud of your son! My husband, son and nephew are Eagle Scouts so I know all the effort that goes into attaining that goal. My Dad always regretted not getting Eagle, but was active in Scouting for 80 years. Congratulations on your some making it to Eagle Scout! My son is in his 1st year of Boy Scouts, when I saw this fabric on Fabric.com I knew I wanted to make him a quilt. I want to make a double sided quilt for him. One side this fabric (s) and the other side his old Cub Scout t-shirts and uniforms. What size is this quilt? I am hoping on making a twin size (would like to see him use it). Thank you for sharing and helping me improve upon my vision for his quilt. The quilt finishes at 56" x 64" What a fun idea to use Cub scouts on the back!! !